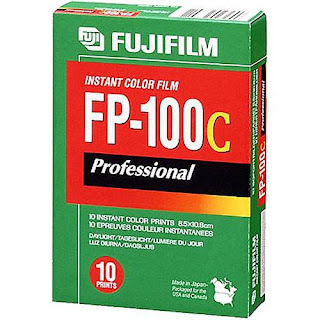 If you are a film photographer, especially someone who shoots instant cameras like the old-skoolie Polaroid 600 line, SX-70, Polaroid Pack cameras, etc., you may have heard FujiFilm has decided to pull the plug on it's last pack film, FP-100c. I'm one of those photographers. Every model shoot I do in studio (yep, that's what I do as my main photo gig) I use some form of instant camera for behind the scenes shots and give-aways. Actually, as news came out it was clear FujiFilm actually discontinued production earlier, and has simply been selling out it's stock. The day the announcement circulated prices shot up on all online outlets. That was expected. The same thing happened when FujiFilm off'd their B&W version over a year ago. The uproar was quick by all types of film enthusiast. Why FujiFilm, why?? Obviously, no word from FujiFilm except for the expected corporate PR flack. Again, that was too be expected. My day job is as an exec at a huge corporation, and I know by experience any news put out is going to be glowing, moving up, love our customers, blah, blah, blah.... Add the cultural component and you get flack with smiles & no comments. Again, expected. There are several efforts ongoing to convince FF to rethink their decision, sell their equipment or licence the technology for peel-apart film. Personally, I think this will go no where, but fingers crossed. What does this mean to me as a photographer? Honestly, not a lot. While I love playing with my Polaroid pack cameras they were more of a novelty. I have about 6 of them, and regularly used the ColorPack III. I enjoyed the process, and the look on my model's face when I pulled the film out of the camera and showed them the results a few minutes later. I would often post online scanned copies of the photo. However, I never did a themed project with the film, nor was it my primary creative outlet. The film quality was almost always top notch which was always nice. While I really enjoy Impossible Project film, the quality of peel-apart film was always superior. It will be missed and the end of an era for both the film type and the multitude of cameras still in use. Lets face it, no digital camera will last that long. Well, I have about 4 packs left and about that many packs of flashcubes as well. I'll use those over the next few months and then that will be that. I'll still use my Instax cameras (until of course FujiFilm kills off that film) and my Polaroids using Impossible Project film. In the meantime I hope the efforts to save the peel-apart film is successful. I'll contribute to the cause as I can.